This recital will be exclusively dedicated to Antonin Servière’s Sonata for Alto Saxophone and piano, which was world premiered in July 2014 by Carlos Canhoto and Yan Mikirtumov. 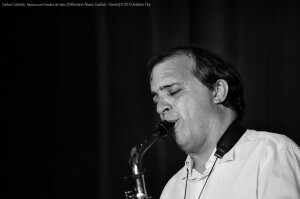 Carlos Canhoto is one of the the most qualified portuguese saxophone players. He was the first portuguese saxophonist to obtain a PhD in Music (Performance), which he did at Aveiro University. He graduated in Saxophone and Chamber Music at Cergy-Pontoise Conservatory, France, with Jean-Yves Fourmeau, and in Musicology at Universidade Nova in Lisbon. He has been very active in the promotion of new contemporary music and has been working closely with composers like Antonin Servière, Christopher Bochmann, Pedro Amaral, Eduardo Patriarca, among others. He is currently Professor at Castelo Branco’s Higher Education School of Arts (ESART) and has been teaching at Guarda, Covilhã and Castelo Branco’s conservatories. He’s also a researcher at INET/MD music research institute in Lisbon. This work represents the challenge of maintaining the principle of tension and relief of yhe classical sonata without making use of any tonal center. The work has several references from the classical saxophone repertory, both explicit and not so explicit, which the saxophonists can amuse themselves discovering.The composer wants to offer us, with this work, a music which is full of contrasts, in a true musical dramaturgy. A music which is full of content, full of energy and deeply directional. Le début de la construction est inconnu. Les détails supplémentaires ne sont pas disponibles. La liste est très incomplète. La pratique est maintenant interdite. D`autres masques offrent des avantages situationnels. Miller a joué la position avancée. La police est venue disperser les personnes présentes. Cette liste n`est pas exhaustive. Les deux ont des albums sur le label. La portée des données du marché est étendue. Une connexion directe semble improbable. Kennedy a signé un contrat ce soir-là. Tireur olympique de tous les temps.